RUSH: Melania Trump went to the funeral of Barbara Bush, and something I don’t think a whole lot of people knew. She did not go alone. She took two members of the White House residence staff with her who had worked there when Bush 41 and Barbara were in the White House from 1989 to 1992. The head usher and the other might have been in the kitchen staff. But she took them with her. They desperately wanted to go and pay their respects, and there was no way. It was invitation only, I mean, to get into the real proceedings aspect of it, and Melania took them with her. And there wasn’t a whole lot of publicity about it, wasn’t, “Oh, look what the wonderful first lady is doing.” It was just learned. And then there’s been a lot of gaga over the photo. 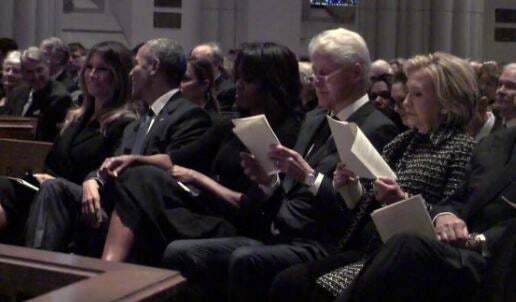 You had Bill Clinton and Hillary, you had George W. Bush and Laura, you had President Bush 41 seated in front, and Melania there by herself. And then she’s seated next to Obama actually during the funeral, and the media was saying this is really, really strange because she was a birther movement person, you know, she was joining her husband in saying Obama was not born in America, and yet there she was sitting next to Obama and they appeared to be chummy and getting along quite well. The media wasn’t happy about it. Do you know this? Over the course of the eight years of the Obama administration, there were a minimum of 30 magazine covers of Michelle Obama highlighting her extraordinary fashion sense. Michelle Obama was a magazine cover girl fashion plate. And I must say, some of it was rather curious. The point is, in a year and a half there has not been one such cover of Melania Trump, who was actually a model and who does fashion very well. And it’s just another very outward sign of the hatred for the Trumps, the pure, raw hatred for the Trumps that exists throughout media. Some of the Drive-Bys were distraught because they think Melania’s gonna be divorcing Trump because of all the Stormy Daniels stuff. And the fact that she went to the funeral and took the White House staff with her kind of puts the kibosh on that.